The Greek government deported more than 200 migrants back to Turkey early Monday morning, the first enactment of a recent agreement between the European Union (EU) and Turkey meant to curb migration via the “Balkan route” into Europe. European police escorted 136 mostly Pakistani migrants from the Greek Island of Lesbos back to Turkey on two small ferries as the agreement went into effect, and a third vessel carrying 66 mostly Afghanis left the island of Chios also bound for Turkey. Some 2000 more migrants have been detained on Lesbos since March 20, awaiting their fate. 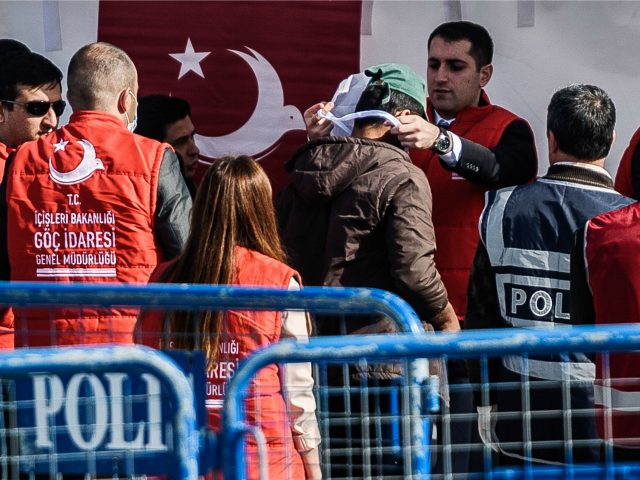 According to the agreement, in exchange for financial and political favors Turkey pledged to take back all the illegal migrants who cross into the European Union from its borders. The Turkish interior minister, Efkan Ala, said that Turkey was prepared to receive up to 500 people Monday and that Greek authorities had provided 400 names. On Sunday, the Athens News Agency reported that some 250 migrants from Bangladesh, Pakistan, Sri Lanka and several African countries will be sent back every day between now and Wednesday. The Greek migration spokesman, Yiorgos Kyritsis, reiterated that the operation would only affect “persons who have not applied for asylum” and those who arrived after March 20. The operation has already met with protests from human rights groups, who contend that the agreement is not legal. On the island of Chios riot police clashed with local residents during one protest against the deportation. “This is the first day of very hard times for the rights of refugees. Despite the serious legal loopholes and the lack of adequate protection in Turkey, the EU is moving forward in a dangerous agreement,” said Giorgos Kosmopoulos of Amnesty International in Greece. “We are expecting violence. People in despair tend to be violent,” said Kyritsis.